Take a look around your basment. Take a hard look and notice if your appliances are rusty. Also check your metal floor vents and baseboard heating. Is your carpet damp? Maybe your walls are damp. If any of this is true you may have a basement water problem. This problem can be new or it may have existed for quite some time. Either way it is imperative to have it looked at. A wet basement can createother problems in your home including possible health concerns or problems. Click here to schedule your free basement home inspection. Wet Walls - This is an easy one. If your basement walls are wet then it is a definite sign that you have a basement water problem. Note to my Long Island homeowners: It is true that we are on an island and surrounded by water , but that does not mean a slightly wet or moist basement wall is acceptable or normal. At the very least it needs to be looked at by a trained waterproofing professional. Damp Basement Wall and Floor Seam / Basement Cove - If this is occurring in your basement than it can be a serious waterproofing issue. This problem is often created by Hydrostatic Pressure. This is another fancy term often used by waterproofing professionals but it simply refers to the water underneath your home and the force or pressure it exerts. We've all heard many times that water will flow through the path of least resistance so any little crack in your foundation is vulnerable to this hydrstatic pressure. Additional, because we are specifically speaking about Long Island basement waterproofing, there is water underneath every single home. You've probably heard mention of the Water Table. Well this water table does not stay static. It changes with the amount of rain, and if we have extended or heavy rainfall the water table rises and hydrostatic pressure takes over and your basement cove is vulnerable. If you see this problem you should call a waterproofing expert to have the problem inspected. 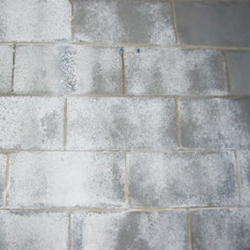 Efflorescence - This is the name for the chalky white powder that will appear on your basement walls when water has evaporated. 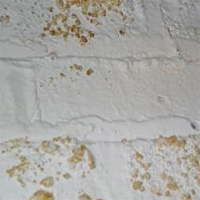 Efflorescence by itself is not dangerous. It is not toxic and can be easily washed off, but it is a sign that you may have a more serious basement water problem. Basement Floor Cracks - It is not uncommon to find cracks in basement floors here on Long Island. 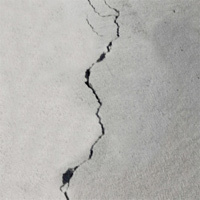 Concrete shrinkage or expansion can often result in floor cracks. The good news is that these cracks are not usually signs of a poor foundation and your home is most often not in danger of requiring an expensive foundation repair. 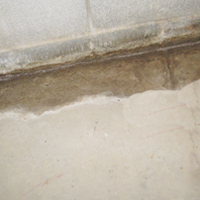 However, as with a basement cove water problem , the results of hydrostatic pressure can often force water through these cracks resulting in wet floors. If your long Island basement is finished with carpeting this can quickly become a serious issue. 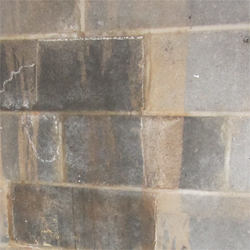 Depending on the visual inspection and the cause of the water seepage, hydro-active grout injection can be a solution, however if this seal is made, it is possible that the water will just travel and exert pressure on other parts of the basement floor or move to the basement cove. An experienced Repel Restoration expert will always present to you your options and in many floor crack situations an Interior Drain Tile System may be your best solution. This system will drain the water beneath the floor to a sump pump and in the process relieve the hydrostatic pressure and thus solve basement floor and basement cove water leak problems. Musty Basement Smell - If your basement starts to have a musty smell it is a warning sign that you may have a water problem. The water doesn't make the smell , but the existance of water is a breeding ground for mold - and the mold is what creates the musty smell. Mold can be a serious problem and can cause health problems. if you or a member of your family has allergies or asthma is is even more critical to solve the leak problem and remove the mold. There is good news... without water it is impossible for mold to grow or spread. Solve the leak and you solve your mold and possible related health issues immediately.